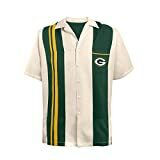 On days when a team jersey just doesn't cut it, this finely made bowling shirt by Littlearth commands attention at the office, in the box at the stadium, or at your favorite sports bar. The shirt is predominately white, and the front features an accent stripe in contrast team color. The microcell fabric is sand-washed, resulting in a shirt with breathable performance, plus incredible softness. The generous yet flattering fit and details like chain-stitching and color matched buttons will make this your favorite shirt for years to come.